Model Si torque wrenches use a quick-change Drive Head with a double-ended socket to help you torque industrial size bolts on heavy equipment. Each low profile, offset Drive Head* is designed with the smallest possible head radius to fit any size API or ANSI flange or other big bolt application. Torque reaction is in the plane of the hex nut or bolt, thereby eliminating the tendency of the wrench to twist off the nut when torque is applied. Operation is simple! One worker positions the wrench on a bolt head and pushes the control valve on the torque wrench. The cylinder rod strokes out and turns the fastener 15 degrees. Separate electrical control pendants are not used. When the control valve is released, the load is removed and the wrench mechanism ratchets. Another stroke can be removed. The Model Si torque wrench will NEVER "hydraulically lock" onto a nut or bolt. To loosen bolts, the tool is simply turned over. From the model Si-1.5 on up to the Model Si-150, you get BMF quality and engineering built-in. Torque output is accurate within 3%. BMF Torque Wrench are stronger. Our Unique and simple ratchet design engages all 24 ratchet teeth at one time. Therefore, the torque load in our wrench is distributed across all the ratchet teeth, instead of high loading on 1 or 2 teeth as in other ratchet wrenches (causing them to prematurely fail). There are no pins, no pawls, and no levers in our ratchet to break or wear out. In fact, we warrant our ratchet mechanism for a full 3 years. Only the worker that positions the wrench on the bolt controls its operation . Nuts and bolts are made quicker and more safely because the times and the risk of coordinating the efforts of a 2-man operation is eliminated. Most BMF wrenches need only 3000 PSI to produce maximum torque, instead of the over 10,000 PSI required by other makers. We manufacture our wrenches from heat treated chrome-moly alloy steel rather than aluminum. Our wrenches and parts are at least twice as strong as wrenches made from aluminum. In addition, our low pressure hydraulic system is inherently more reliable than others requiring 3 times higher pressure. All of these features combine to give you a hydraulic powered torque wrench that can be safely, reliably, and quickly torque industrial size bolts. Model Si Torque Wrenches are available with any size or shape socket, in inch or metric sizes, from 1" to 9-1/8" (25mm to 232mm). *Each Drive Head is a complete ratcheting box wrench and is easily changed out. Individual sockets are also available. Model Si Torque Wrenches fit directly onto nuts and bolts and apply torque in the plane of the bolt head. This design eliminates the tendency to twist the wrench off bolt heads when torque is applied. By removing two bolts and a clevis pin the operator can quickly and easily change the Drive Heads. 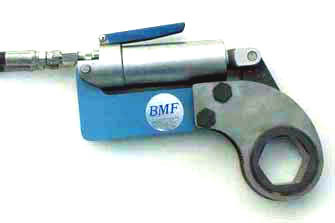 In addition to the standard line of Model Si Torque Wrenches listed here, BMF Torque Wrench Co. offers custom designs which can torque bolts in pockets and other areas which are difficult to access. Call us today for a free consultation and quote. Also available are 12-point hex drives, octagon drives, spline drives and square drive adapters to fit standard power sockets. Choose a Model Si Torque Wrench when you want to safely, quickly, and reliably torque large nuts and bolts. 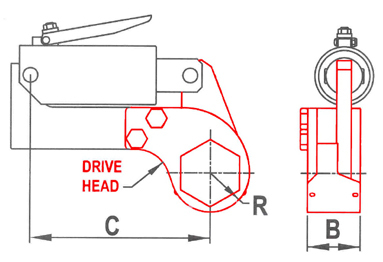 For data on individual Drive Heads visit our Drive Head page.